1960’s Vegas meets 1950’s Waikiki. 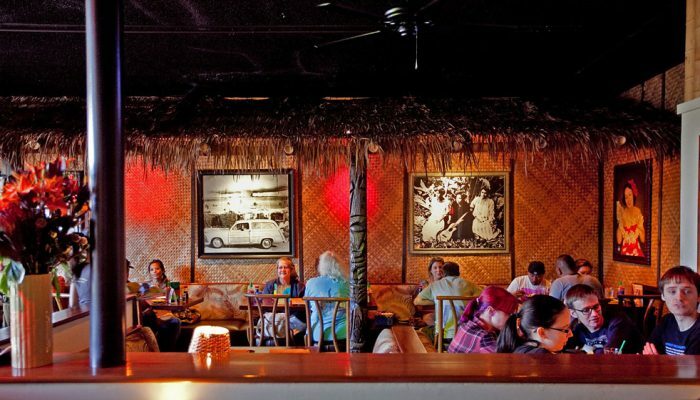 Winner of 2009 Good Times Best of Santa Cruz reader’s poll for “Best Restaurant”, Hula’s offers an amazing dining experience in a kitchy yet swanky tropical setting. We have a passion for fun and friendly service, the freshest fish, great steaks, and seafood, all with Hawaiian fusion inspiration. 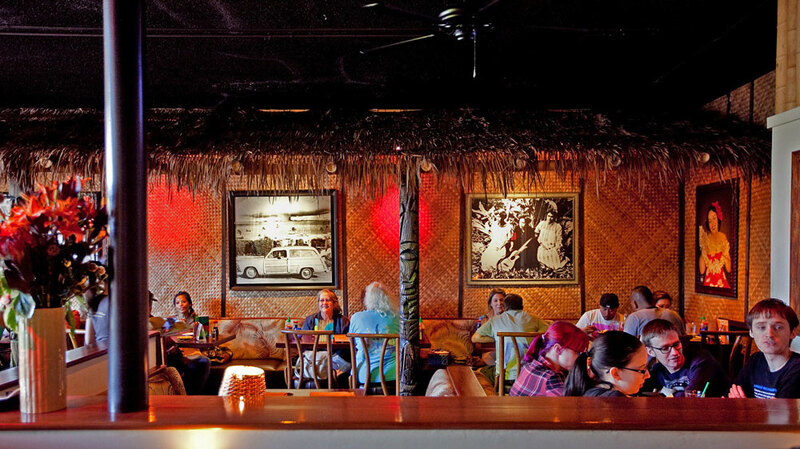 A full service Tiki Bar with tropical cocktails that will knock your flip flops off! At 61, Zoccoli’s Italian Deli is one of the oldest and most familiar family-run businesses in the county. It has been operating almost nonstop in the same location in downtown Santa Cruz since opening in 1948. Located in the heart of downtown Santa Cruz, Kianti’s Pizza & Pasta Bar stands boldly amongst fellow businesses with its vibrant colors and welcoming atmosphere. The contemporary look and feel proves to be popular with both locals and tourists. The indoor lively and upbeat atmosphere is a crowd pleaser, with weekend performances with our very own pizza spinning champion and a flame-raising kitchen. For those preferring a more relaxed experience, dine within the heated patio and cozy up to the fireplace. Based in a small little shop next to the Santa Cruz bookstore, this shop inspires the mind to the beautiful possibilities of eating chocolate based foods. Chocolate the Restaurant, opened it’s doors on November 1st, 1999. The idea was to have big time talent, big time food, and big time fun. Wat dat dere causin’ all da commotion in downtown Santa Cruz? Louie’s Cajun Kitchen & Bourbon Bar, dat’s wat! Louie’s be one cool, funky, N’awlins-style celebration of food, libations and bluesy sounds bouncin’ off some of da wildest wall art dis side of the French Quarter. Laissez les bons temps rouler with an awesome Hurricane (or deux) as you peruse our eclectic menu of serious cajun goodness. Jambalaya, PoBoys, fresh oysters, crawfish, gumbo, and authentic melt in your mouth BBQ, are just a few of the classic New Orleans dishes that will send your taste buds soaring. And ova dere behind da bar, cher, is the finest selection of bourbons dis side a Bourbon Street. Located in the heart of downtown Santa Cruz, we opened our doors in December 1992 in a circa 1928 building, owner Paul Cocking transformed the interior into today’s romantic space by adding arches to complement the Moorish front door. Founding chef of was the now famous Jim Denevan of Outstanding in the Field. Gabriella’s has been recognized in Sunset, Fodor’s Travel Guide, and many other guides and newspapers. We feature a new local artist every eight weeks. Prominent regulars are Charles Prentiss, Stephanie Martin, Hildy Bernstein, Tom Maderos and Dale Johnson. Welcome to Red. Lounge in front of the fire place with friends, great food, and cocktails at Red Restaurant and Bar. Red offers large, small, and shared plates made primarily with organic ingredients and inspired by a variety of influences including American and Mediterranean cuisine. Red Restaurant and Bar is sophisticated and elegant with menus that are fun and young. Open for dinner and late night dining, Red is located upstairs in the Historic Santa Cruz Hotel at the corner of Cedar and Locust in downtown Santa Cruz. Lúpulo (Loop-oo-low, which is Spanish for hops) is a craft beer restaurant, tasting room, and bottle shop owned by husband and wife team Stuyvie and Noëlle Bearns in downtown Santa Cruz. Through their upbringings and travels throughout the world, Stuyvie and Noëlle have developed a deep appreciation for new and out-of-the-ordinary foods and beverages. Among these passions, craft beer from around the globe has been an important part of their culinary evolution for more than a decade. Always searching for rare, new, and exciting beers, they often wondered why there was not a dedicated space for beer culture in Santa Cruz such as those that exist throughout much of the United States. After tiring of having to travel to the Bay Area to get the beers they were seeking and discussing the idea with the many fellow craft beer lovers that live in the area, Stuyvie and Noëlle decided that perhaps it was their calling to bring such a space to their beloved town. Shogun is a long, narrow restaurant that blends traditional and contemporary Asian and Western. Track lighting in shoji-screen boxes illuminated numerous Japanese prints, two gorgeous kimonos and several knife-savvy chefs behind the handsome sushi bar. Pale ochre panels with white trim complemented walls of black granite and red marble. Mobo Sushi has been serving Santa Cruz “Mind Altering Sushi” since 1988. Enjoy house specialty sushi rolls and sashimi, daily specials, and endless possibilities of custom rolls including vegetarian & vegan options. We offer a full bar, sake selection, and are home to the sake bomb dominos on Friday & Saturday nights!